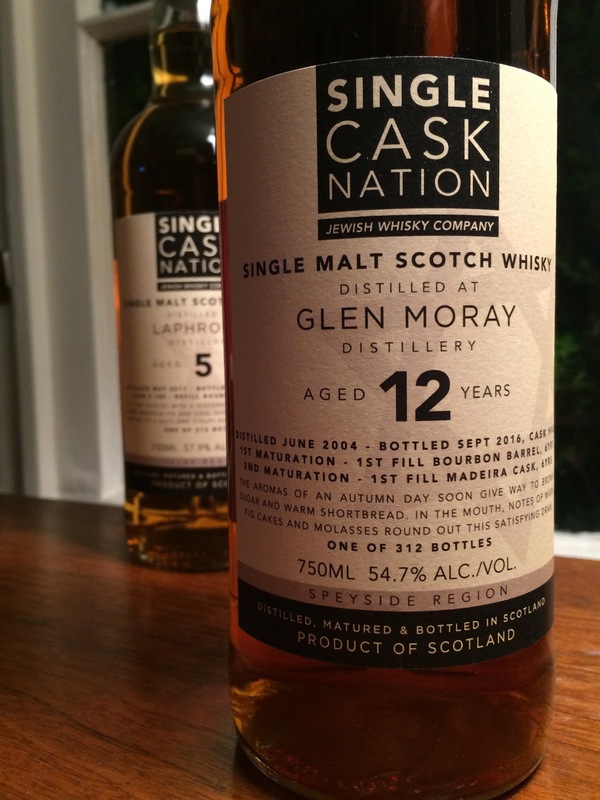 Single Cask Nation Glen Moray 12yo (54.7%): Today I have two fairly recent releases of Single Cask Nation bottlings on my desk... 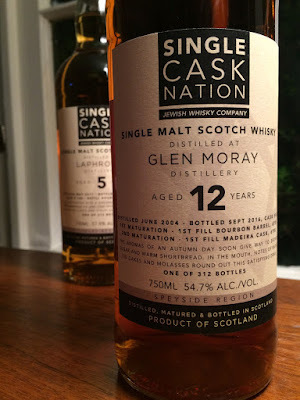 I will start with the Glen Moray. It is a double matured whisky rather than a finished one like the Arran 12yo they released some years ago. After being distilled in June 2004 the whisky spent first six years in first fill bourbon barrels and then transferred into a single ex-madeira cask for another six years. It is bottled in September 2016 at cask strength. The cask was numbered as #9943 and yielded 312 bottles. Nose: Dried cranberries, cherry soda and molasses. Black currant jam and black mulberries. So juicy and tart I could possibly list here all the black and red berries and stone fruits I know of... You get the idea... A few drops of water changes the course a little, we have additions now: Carrot cake, cloves, cinnamon and nutmeg dustings on a milky espresso drink. Palate: Caramel chocolate, sea salted caramels and ginger molasses cookies. Pretty hot and bitter on the palate without adding water. A few drops solve the problem: Dried fruit cake, lemon juice and unsweetened and over brewed green tea. Lemongrass and bitter greens. Some garden soil, green sour worms and sumac. Funny I was so prepared for a sweeter palate in spite of the tartness on the nose but not at all... It's mostly still tart, vegetal and bittersweet. Finish: Short with lemon juice, pomegranate seeds and green tea. Even more bitter and quite dry finish.